Touch-screen innovations in Comecer technologies. 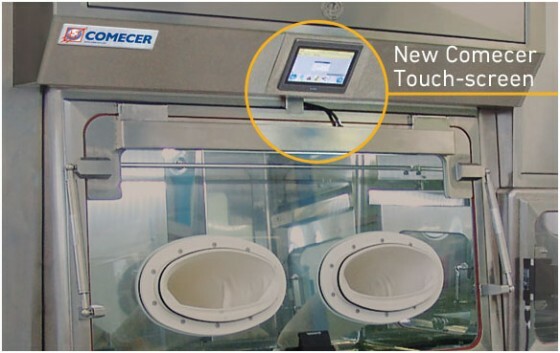 Comecer adopts touch-screen technology in its isolators, shielded cells and automated machines for nuclear medicine and isolation technology. The constant technological evolution makes it necessary to adopt a new approach and understanding of the design and human-machine interaction (HMI). The technology of the communication protocols, the need for ergonomics, safety and the industry-specific regulations are all key elements to think of an optimal HMI design, which takes full account of the experience, psychology, requirements and behaviour of the operators in a given work environment. Therefore, one of the principles adopted by Comecer is to always adapt the technology to the application. This technological adaptation, which in certain cases can be called innovation, can only be defined when basing it on a number of priorities to which the system must respond. General functionality. The objective is to provide an HMI system that can clearly communicate the information required for the specific task to be performed. Level of complexity of the input. Touch-screen HMI systems are very common in all sectors as they can simplify complex operations. Entering data and parameters that govern system operation is intuitive and immediate. Furthermore, the interface can also be modified by entering new buttons or graphic components. Cleanability. This is an essential aspect, which represents a priority for so called «clean» productive environments, such as those in the pharmaceutical sector. Using a touch-screen HMI can make it more difficult to deposit particles and dust on the surfaces, whereas it enhances greater efficiency and cleaning in less time. Alarm and diagnostics. Malfunctions and the consequent easy identification of the causes and solutions can be signalled via text messages or better still, icons (understood regardless of the language spoken by the operator). The symbols used and their intuitive reference, also to mechanical parts, make the system very user friendly and facilitate the possibility of providing a guide for each function or operating status. Traceability. Another important characteristic is the possibility of monitoring and keeping track of the system use and operating conditions through the logging of the events related to the operator or the production performed. Particularly, a graphic log can be kept of the important variables, such as pressure, temperature, humidity and laminar flow speed. These logs can then be easily exported in electronic format and transported or processed for example for statistical purposes. Style. The operators respond well to an attractive interface. Ergonomic technologies, such as a tactile sensation or dynamic colour lighting, lead to a more informed, reliable and pleasant use. The effectiveness of the HMI system and the consequent increase in user productivity depends on a complex design process, which incorporates all the technical, ergonomic and communication aspects. The communication and connection technologies, namely those that connect the HMI to the base application and to other transferring devices, directly affect the operator and the overall performance of the system. Selecting an adequate communication strategy (hard-wired, serial bus, wireless, and other options) requires a careful and expert evaluation of the application, and in many cases, the study of a mix of technologies available.